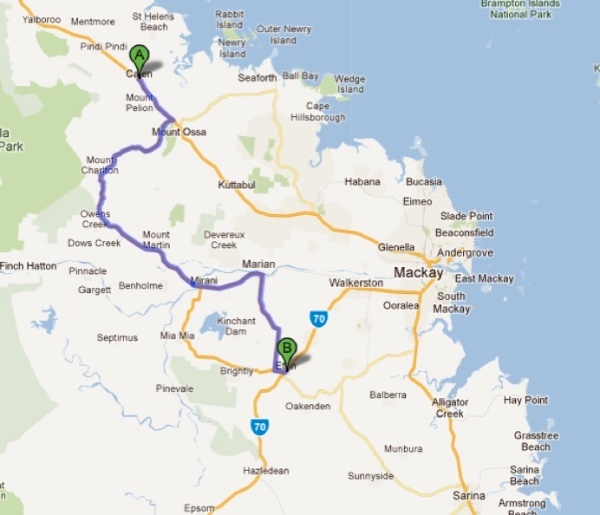 Spring has arrived and so I'm heading south again - as a way of getting off the Bruce Highway yesterday I took a really scenic detour through the foothills and valleys and skirting Eungella National Park - I'd recommend this brief detour but it's probably best to continue on down through Sunnyside to Sarina. I went south via the Fitzroy Developmental Road which, although it's a good enough road, was not very enjoyable as it's mainly scrubby plains. Sugar-cane is being harvested at the moment and these "racks of bins" are waiting for the narrow gauge locomotive to take them to the nearest mill.